this recipe has been developed exclusively for Tay Tea by pastry chef, Lizabelle Burke. Master tea blender Nini Ordoubadi’s loose leaf teas are a mild obsession for those familiar with them. Alone, the teas are notable; as ingredients in recipes, unbelievable! This recipe for light, rose-based cookies uses exotic Damask roses – superior in aroma and beauty to all other roses. Damask roses are fragrant, bright and normally used as perfume, so just imagine the effect these flowers have in these tea-party ready cookies! We hope you take this beautiful recipe beyond imagination and whip up a batch for a few best friends. If you’ve been looking for an excuse for a formal tea party – this is it! Beat together ground tea, sugar, and butter until fluffy and lighter in color. Fold in the flour gradually and continue to mix until uniform dough is formed. Roll dough into a log using wax paper (or plastic 1 1/2″ diameter). After chilling, slice into 3/8″ thick cookies on bake sheet. Mix the icing. It is a simple glaze, just be sure not to make it too thick. Ice cooled cookies with brush. Top with rose petals while glaze is still wet! Persian Rose tea blend and Organic Rose Petals available for purchase at Tay Home , Andes, NY ( Tel # 845.676.4997 ) and on line : www.taytea.com as well as in ABC Home in NYC. 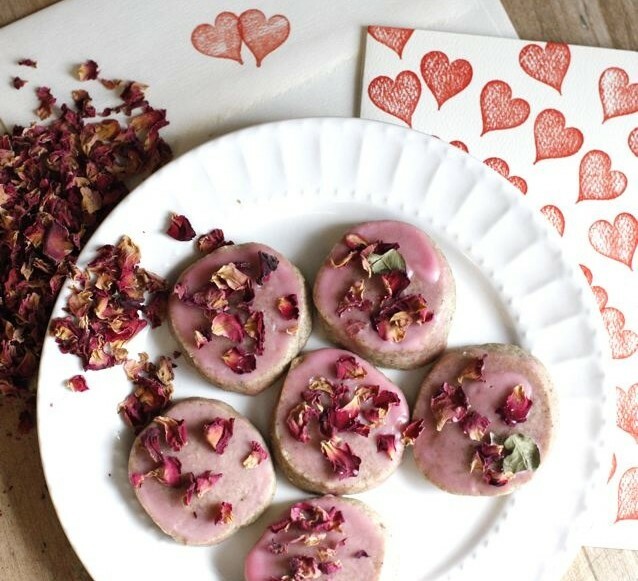 Share the post "Tay Tea’s Persian Rose ‘Love Spell’ Cookies"
This recipe makes 72 cookies ? Or 7? Can you use spelt instead of flour?